The II CINBIO Annual Meeting (PACBB 2018) took place in Vigo (Spain) days 25th and 26th June, and the SING group participated in different ways. 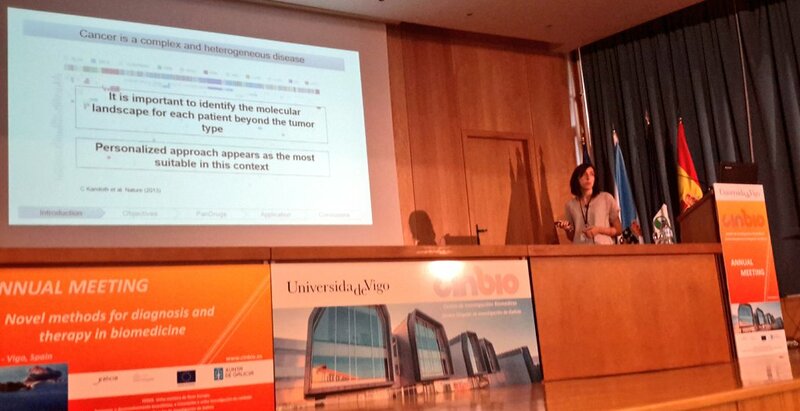 First, PanDrugs was presented by Elena Piñeiro-Yánez from the CNIO Bioinformatics Unit in a talk entitled "PanDrugs: novel method to prioritize anticancer drug treatments according to individual genomic data" (click here to see her talk). PanDrugs, recently published in Genome Medicine, is a feasible method to identify potentially druggable molecular alterations and prioritize drugs to facilitate the interpretation of genomic landscape and clinical decision-making in cancer patients. Secondly, our SEDA software, developed in collaboration with the Phenotypic Evolution Group from Porto, was presented as a poster presentation entitled "A toolbox for facilitating the manipulation of FASTA sequences". And finally, Daniel Glez-Peña acted as chairperson of the first session of the second day. The presentations can be seen online at UVigoTV. We take this opportunity to congratulate the organizing committee of this II CINBIO Annual Meeting for the excellent organization and the huge effort made for the ocassion.